As part of the Chelmsley Wood shopping centre regeneration project, the library needed to cater for all sections of the community. 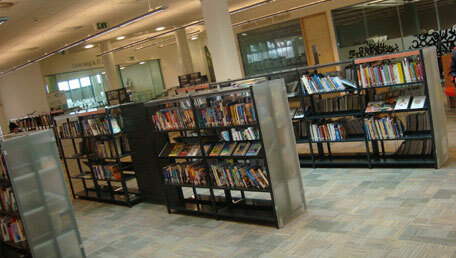 Solihull council required a modern library with an open plan feel that would be inviting and vibrant. The design needed to be modern with visual impact to engage customers on entry. A separate space was required for a children’s area for local school children to visit. It was essential that a local studies area was featured in the library to enable visitors to access resources on the local area. Bright colours were used throughout the library and modern bespoke furniture added to the contemporary feel that was required. On entering the library customers have an opportunity to interact with the space in a number of ways before reaching the helpdesk. Dynamic Freedom display units from FG Library brightened up the space to enable customers to choose from a selection of new releases.